An incredible winding road named TransSemenic connects Reșița from Slatina Țimiș over the Semenic Mountains. It climbs smoothly through the green forests that open from place to place, with valleys that glimpse among the old trees and with the stunning landscapes of the peaks – all these will make you believe that you have reached heaven. Is not a crowded area at all so it’s the ideal place to relax, meditate and reconnect with nature. It’s quiet. It’s just you, the wind running through the forests and the birds, beside the sound of the springs of the valleys and the crickets that jump the grass. In Văliug village, there is a road that climbs to the Gozna Lake. Upper, far from the bustle of the center, on the bank of the river, I had the chance to discover an incredible guest house with a very appreciated restaurant. Hardly, I found a free table to stay and eat one of the interesting dishes on the menu. Andreea Tomoiagă opened the guest house in 2006. She loves Austria and how all the accommodations there make the tourists feel like home. So she stayed there for a month with an architect to get some inspiration. And she decided: „that’s the way I want the living room to look like”, „I want this kind of rooms” and so on. They returned and build the perfect villa in the forest. Andreea bought all the furniture from the antique shops and restored it. So each room has different colors and models because the furniture is not serial. So, the rooms look like in the movies. A very cozy and nice place, children-friendly also, has many facilities to offer: a pool, a Canadian-style wooden chalet for team buildings, a conference room, sauna, and a stunning fireplace at the entrance. 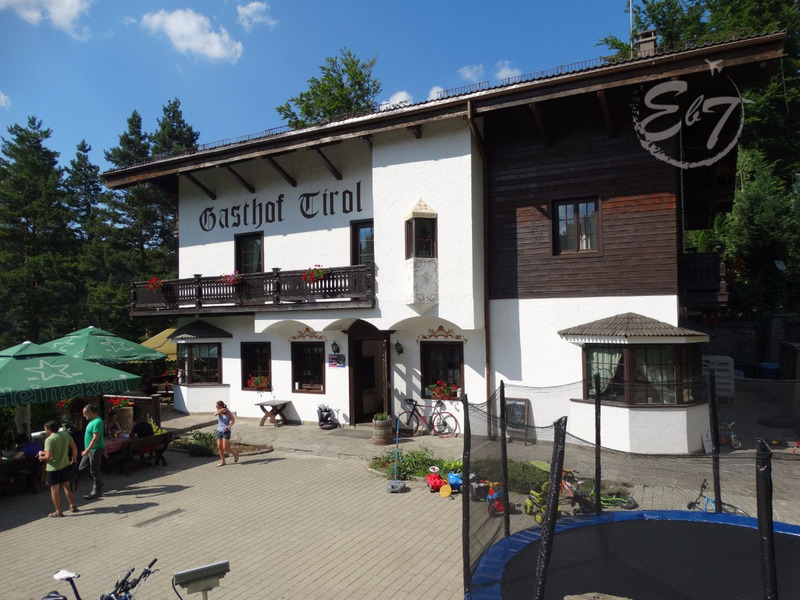 Gasthof Tirol offers 14 rooms, seven twin rooms, and seven matrimonial rooms. Once I entered the room, I felt the air of the original Tirol. Very-very clean, with a bathroom big enough, won my appreciation in the first three seconds there. Also, I loved the hand-paintings on the wooden furniture. The sunshine lightened the room so beautifully. I went on the balcony, and a stunning view welcomed me: I could see the lake among the old trees. Definitely, a 4* experience in a village in the mountains! I had the very nice surprise to find on the menu some dishes I’ve never seen before in Romania, like the chicken with oranges and cinnamon, Jägerschnitzel, Valdostana (pork with Napoli sauce, wine and cheese), Salmon with goose liver and many more. I also noticed a great variety of pasta. In the kitchen, I had the chance to meet the cookers and the students that were making internships. I had the nice surprise to see that every dish is cooked fresh and separately, including the pasta sauce! Even if you’re far from a city, you cannot get bored. There’s the lake for boat rides or canoeing. In the area, you’ll find Two ski slopes. The “Casa Baraj” slope is 800 meters long, it has snow cannons and lights, and the Semenic-Văliug slope is 5800 meters long and you can ski from Semenic to Văliug. More, there a lot of routes in the mountains. Semenic Mountains are a National Park with great places to explore. Here are 11 marked trails of different difficulties. You can climb to Semenic Peak, to Nera Springs or Comarnic Cave, the biggest cave in Banat Region (5.5 km long, you can visit with a guide 1.7 km of it).